Good Morning! Happy Monday! Did you have a great weekend? I sure did!!! Today... I came across this "surprised" little fellow and I burst out laughing ... I had to share him with you! 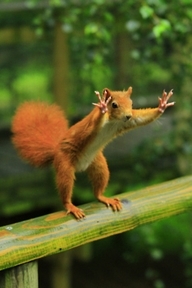 Doesn't it look like he's saying STOP... WAIT... DON'T MOVE!!! I have an awesome decorating tip to share with you... that you can start "hunting" for NOW - then you'll be ready for spring. 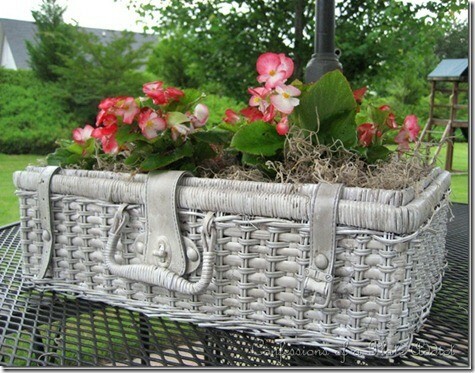 Check out this beautiful flower box! This is a rattan/wicker suitcase - you can find them all of the time in flea markets and antique stores - CHEAP!! They have spray painted it white and then filled it full of beautiful flowers and plants. Lining the inside with a plastic bag would be a great idea to protect the wicker longer. This would be so pretty with several of them in a display on your patio. Heck.. you don't even have to paint them white...what about pink or light green or a soft yellow? For you primitive girls - black, deep brown, dark navy! The sky is the limit when it comes to buying spray paint! You do want to look on the can and be sure it will adhere to wicker.. and the handle the outside elements. Happy spraying and planting! If you all do this project - send me a photo so we can put it on the blog. 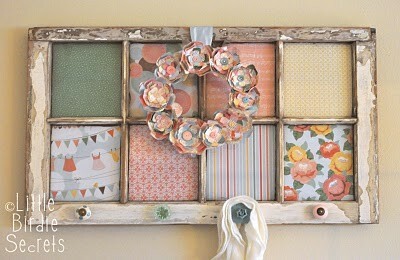 Here's another cute decorating fun project. All you need is an old window and scrapbook paper - pick out the colors to match your room, paste them into place, add a hangar to the back of your window... and boom... you're finished. They've added antique door knobs to the bottom and hung a wreath to match! 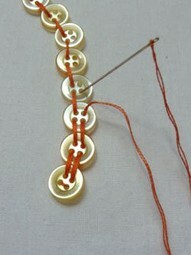 They will show you how to do other things with buttons - but I wanted you to see closer how the buttons were attached together. Have fun making this sweet thing! Look at this lamp? Is this not the most adorable thing you've ever seen? I tried to find a "project" link to make this sweet thing - but it didn't exist. This was an actual lamp that was for sale. 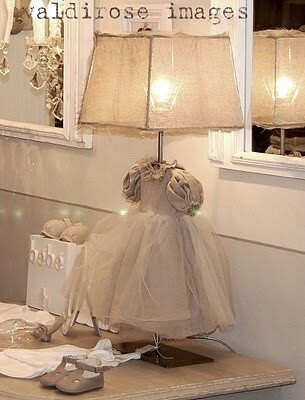 So..... this is my idea - find a sweet lamp that is of the correct height for your sweet little dress. You can find these antique dresses in the antique stores. 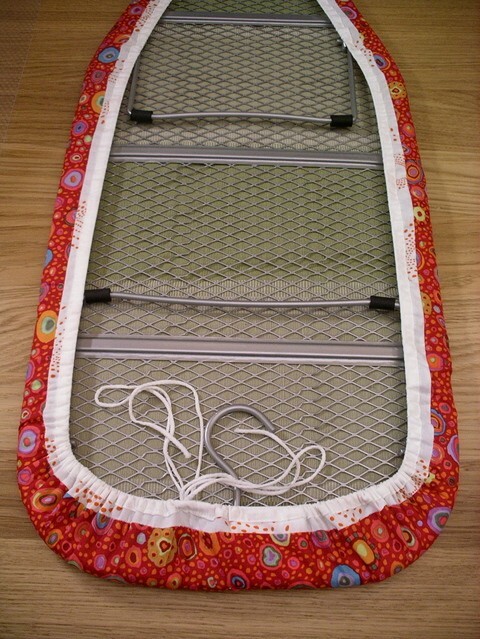 Buy you a cute little child's hangar with a swivel hook - place the dress on your hangar and hang from the inside of the light unit. Don't you think that would work? I just think it would be so sweet in a little girls room. Or.. how about finding a cute little boys sailor suit and do the same thing... change the lamp shade to blue or red, hang the sailor suit on the lamp... and now you have a cute addition to a little boys room. LOVE THIS IDEA!! Declutter candles - like the one that is bent - or the one that won't stay lite. Throw them away and tell yourself it's "OKAY TO BUY NEW ONES" !!! Ta Ta!! It's off to cross more "done" things off my project list!